Welcome to Day Five of the Sixth Annual Diabetes Blog Week. TGIF, right? The week may be winding down, but it isn’t over yet. We’ve still got three days left so let’s get to it! I’ll admit, I don’t have the best eating habits. My food choices can often be better, but I’m working on it. So today I thought I’d share the good, the bad and the ugly of what I eat. I love apples with peanut butter. I slice my apple into wedges and spread each one with chunky goodness. Sometimes I’ll weigh the apple and measure out the peanut butter to get the carb counts, but usually I’ll just swag about 30 carbs for the apple and 8 for the peanut butter. These cereal bars are quick, organic and have a precise carb count of 26 grams. But they’re also highly processed. One of my goals is to work on eating less of the processed stuff. A big Cappuccino Chip muffin from the bake shop of my local supermarket. I guesstimate it to be around 75 grams of carbs for which I generously pre-bolus on a dual-wave setting. It often trips my high alarm, but not every time, making it impossible for me to nail down the right bolus. I don’t eat them often but oh how being a little bit bad can sometimes taste so good. PS: breakfast always includes coffee. Coffee is a non-negotiable must!! My coffee mug is huge (thanks to Hilary, who hand made it for me) and fits 5 cups of freshly ground and brewed dark roast with a little light cream. A one-unit bolus covers this perfectly. I love salad. If it’s from a restaurant I usually have to bolus a couple units to cover any sweet ingredients in the dressing and any bread served with it. When I make them at home I usually don’t bolus at all. The salad above was mixed greens with cucumber and goat cheese and home made lemon vinaigrette. I wish I had remembered to sprinkle on some slivered almonds. When I’m not particularly hungry, or feeling lazy, I reach for a Greek yogurt. I like the ones with the mix-ins. I really like the ones with mix-ins that are chocolate. So yeah, it’s really more like eating dessert for lunch. Even uglier than those Greek yogurts is the fact that many days I skip lunch all together. I’m often just not hungry at lunch time. Carb count = 0. No bolus needed. Still not a good idea. I don’t have pictures of my dinners, but I often make what we call Cornflake Chicken. It’s an oven-baked version of fried chicken and it’s so good. The recipe is from The Chew. (Warning: when you click on the link it’s likely that a video will start playing. Just in case you’re secretly reading blogs at work or something. Not that you would do that.) I usually make steamed broccoli as our side dish. Also, I make these as nuggets (using white meat only because I don’t care for dark) and I dip mine in a little buffalo sauce. Stir fry!!! This is my go-to easy dinner. I make it with packaged stir-fry noodles from the produce department (that come with a powdered flavor packet . . . I know), a bag of broccoli salad, and what ever protein we’re in the mood for. Usually beef, but sometimes chicken or shrimp. It’s my favorite quick, one pan dinner. But again, that stir-fry pack is pretty processed and probably high in sodium. Risotto. I love risotto. I make excellent risotto. First, sauté some chopped pancetta. Take it out of the pan and add some garlic. A minute later, add the Arborio rice and let it toast a bit. Then slosh in some white wine to deglaze the pan. Then add chicken stock a quarter at a time, waiting about 5 minutes for the rice to cook and absorb the stock before adding more. Then stir in some parmigiano-reggiano and that pancetta you sautéed . Carb count? You don’t want to know. But it’s comfort food at its finest. Add some roasted asparagus on the side and a glass of that white wine and I’m happy! A handful of this trail mix is what I reach for when I’m behaving. It’s got almonds and cranberries and crunchy sesame thingies. I totally swag the carbs. Oh how I love chips. Ridged chips with onion dip. Plain old thin chips. In an effort to be a bit more healthy, I’ve been buying whole grain chips instead. I think they’re baked, so that’s good. Right? Mmmmmm, who doesn’t love a good cupcake. The picture shows my favorite recipe Dark Chocolate cupcakes. The peanut butter frosting from the recipe is divine as well, but the cupcake above was topped with regular cream cheese frosting instead. I just love cream cheese frosting. I modify this recipe, adding extra butter and sugar. Oh boy, now I’m hungry!! Here are more Foods on Friday - Friday 5/15 posts. 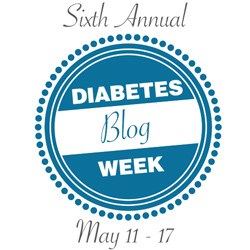 What is Diabetes Blog Week? Click here for an explanation and to sign up. You can also check out a list of participants over here. I love how you separated this into the good, the bad and the ugly! I think we all have those categories! Love your approach to this post! Its hard to believe muffins have that many carbs in them - something like the equivalent to a burger and fries I think - crazy! I love how you did this, good-bad-ugly! We too love apples with PB. Magical combination. Your mug is so pretty. It really hold FIVE cups? I love the good, bad, and ugly versions! I LOVE Chobani Flips and have them almost every day for breakfast. Are those bad? I do see a larger spike in blood sugars with them so maybe they are!! HA! Most of the ugly food looks great to me! Hey, I already have to take care of my diabetes so why bother with food as long as I like it (and can bolus it)! Love this post! True confession: I'm not always a good eater either. I can pretty much copy your good, bad, and ugly snacks... especially if you subsitute pie for cupcakes. The best we can do is the best we can do today. Everything on there (good, bad, and ugly!) actually looks so yum. Cappuccino muffins exist? Oh my goodness I've been missing out! Love how you put all this together. I don't think your bad and ugly are all that 'bad' though, just us diabetics being human! Oh risotto how I love thee! I am going to try your recipe and will send you my fave to try. I realize I made a mistake - add the stock in FIVE minute increments, not 20. That would be crazy. I'm going to edit the post to fix it.